Fifth grade field trip to Marin headlands on Friday, May 27th. No school on Monday, May 30th. Last day of school on Thursday, June 2nd. Minimum day schedule, pick up at11:35am. Thursday, June 2nd the Kindergartners will be doing a singing send off for the parents at 10:45 with a quick reception to follow. The 6th Grade Promotion Celebration Ceremony is Thursday, June 2nd, at9am in the MPR. Invitations should have been given out on Friday, May 20th. Each student received two invites. Snacks and refreshments to follow. Voters will make many decisions on Election Day in November, including the selection of individuals to fill open seats on school boards throughout the County. The Santa Rosa City Schools will host a Prospective School Board Member Workshop for those interested in serving our schools, students and families. This workshop will take place at the Santa Rosa City Schools District Office on June 21st, and provide information regarding the importance and duties of these critical positions. Taught by Tina Hiatt and her daughter Bailee Hiatt (Proctor Terrace and SRHS ArtQuest Visual Fine Arts alumni). All sessions will be held in Room 31. Session Time is 1:00 – 3:00 p.m.
4 sessions offered at $100 per session. Learn more about you and make new friends! Learn about all the greats! Pablo Picasso, Frida Kahlo, Henri Matisse, and more! Try working with new materials. Sculpture, paper dolls, felting and more. Make your own books and journals. Express yourself through visual journaling and creative writing. Work with different textures and effects. Create pop-up books, accordion books, and handmade paperback journals! Did you enjoy the art and music festival during open house? Now you can bring it home with you! Bid on FB on the sixth grade’s Chihuly-inspired masterpiece, coordinated by our beloved art docent, Margaret Batchelor. This lightweight sculpture is perfect to mount over an LED or fluorescent (low heat) light fixture or to dress up with bee lights (like we have here) and display anywhere in your home. 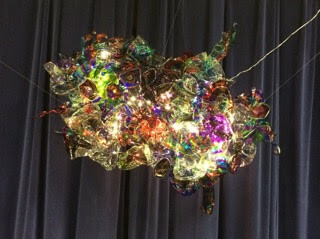 The faux glass pieces of this sculpture were designed by each sixth grade student on glasses, plates and sheets of plastic, and then melted and compiled to make this unique sculpture. All proceeds will benefit the Art Docent Program at Proctor Terrace. Bidding will end at noon on the last day of school, June 2. Good luck! As the school year draws to a close, your 2016-17 PTA Board is excited to start planning another great year! Would you like to join other enthusiastic parents in relaxed get-togethers and be part of planning next year’s programs for Proctor? 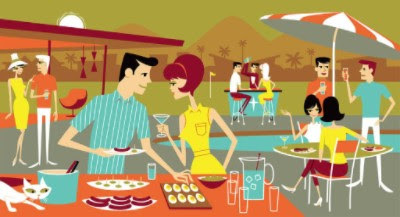 Now forming, summer committees will meet a few times over the next few months to plan priorities and outline events and activities for next year. These committees include: Budget, PTA Climate, Building Projects, PTA Structure and Classroom Enrichment. Planning committees are open to all and will be chaired and facilitated by a Board member. Committees for our two fun fall events, Walkathon and Tigerfest are also forming. If you are interested in being part of any of these exciting summer committees, or would just like more information, contact Bess Allen atpresident@proctorterracepta.org. PLEASE take a moment to stop by the Lost and Found! Items that are left will be donated the week of June 5 to a local charity. There will be a Maker Camp for 4th grade students moving into 5th grade, and current 5th and 6th grade students at Comstock Middle School, June 14th – July 8th , Tues – Fri/8:00- 1:30. Breakfast and lunch will be served. Registration forms will be in the office. We’re approaching the end of the year, and what a year it’s been! So many memories have been had by all, and what better way to remember them than a yearbook? Your Proctor Terrace PTA wants to ensure that every student received a yearbook, regardless of financial ability, so yearbooks will be ordered for every student at the school. While payment for these yearbooks is not required, donations to help offset the cost are welcome. If you’re interested in donating, we have a suggested donation of $15 per student (but any amount helps). If making a donation, please attach your donation to this flyer and return to the office. Thank you for helping to make this such a great year for our students. We couldn’t have done it without you!